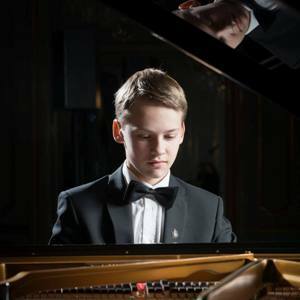 Kasparas Mikužis, born in 2001, was introduced to the piano at the age of 6 when he began studying with Liudmila Kašėtienė at the Šilutė Arts School. Afterwards, he studied at the National M.K. Čiurlionis School of Arts in Vilnius (Lithuania) and is now furthering his musical education at the Purcell School for young musicians in London (UK) with Justas Dvarionas. With a growing passion for music and great talent, at the age of 9, he was recognised by the ‘SOS Talents’ founder Michel Sogny who decided to support him in his musical studies. It was at this age that Kasparas began performing in many countries across Europe. Kasparas’ unique and prodigious piano playing was appreciated by the jury in 2013 when he won 1st prize in the international competition “Young musician Tallinn” in Estonia, where, in the finals, he played with Tallinn’s chamber orchestra. In 2015 Kasparas won 1st prize in the PIANALE International Academy & Competition in Fulda, Germany. He was awarded a concert in Fulda and the opportunity to record a CD with “KNS Classical”. In 2016, Kasparas won 1st prize in the international Volodymyr Krainev Piano Competition in Kharkov, Ukraine and Grand Prix in the 10th international Balys Dvarionas competition for young pianists and violinists in Vilnius, Lithuania. Kasparas has also participated in various masterclasses with great pianists, including Grigory Gruzman, William Fong, Pavel Nersessian, Mūza Rubackytė, Uta Weyand and others. Since 2011, Kasparas has performed in the yearly Christmas concert held on the Champs Elysées in Paris. In 2012 he was given the opportunity to appear in a concert in Georgia, which was televised by Mezzo TV and watched by both the Lithuanian and Georgian Presidents. He has also performed in the United Nations Headquarters in Geneva on four occasions and at the EMMA World Summit of Nobel Prize Peace Laureates in Warsaw, Poland. In 2015 and 2017 he performed in the Concertgebouw Hall in Amsterdam, Holland. In 2018 he played in ‘Fazioli’ factory in Sacile, Italy. Kasparas has also appeared in concert halls in Latvia, Estonia, Austria, Italy, Germany, Russia, Ukraine, United Kingdom, Portugal, Serbia and in many towns of Lithuania. In 2017 the Mstislav Rostropovich’s charity & support foundation ‘Pagalba Lietuvos Vaikams’ awarded Kasparas with their support and later in the year he received a letter of gratitude from the President of Lithuania for his role in representing Lithuania on international stage. You can listen to Kasparas here. If you are interested in working with Kasparas, please get in touch with the EMCY Office.